In order to exceed holiday shopping season goals, smart marketers are always looking for opportunities to get ahead of their competition. It’s no secret Black Friday and Cyber Monday are the two most important shopping days of the season, but there’s another key opportunity you should prepare for: Green Monday. Green Monday is touted as the third largest online shopping day of the year, behind Black Friday and Cyber Monday. It falls on the second Monday of December, or at least 10 days before Christmas. This shopping holiday began in 2007 with eBay, which used the term to describe a particularly popular December shopping day. Since then, other stores have adopted the name and used it for holiday sales, with some retailers calling it Cyber Monday 2, instead of Green Monday. Despite strong data, Green Monday is often not taken advantage of. Even though holiday sales are starting earlier and earlier each year, extended 2016 and 2017 holiday shopping seasons resulted in a large share of money spent between Green Monday and Christmas according to comScore. From 2016 to 2017, during the week of Green Monday, eCommerce desktop sales increased by 20%, from $7,562 to $9,044 million. Criteo knows first-hand that our clients have seen an uplift in sales, revenue, and CVR on Green Monday. As our Seasonal Sales Dashboard shows, US retail sales saw an uplift of up to +186% during the week of Green Monday last year (Dec. 11-17, 2017). One retail mattress company allocated additional budget to carry over their investment levels following Cyber Monday with a approach. They continued to target shoppers throughout Cyber Week, focusing on consumers when competition was lower, staying ahead of the competition focused on Green Monday, and maximizing revenue through their shipping cut-off. They saw a 10% increase in revenue and a 13% increase in sales compared to the previous sales period. One food company optimized for the opportunity by maintaining their post-Cyber Week CPC rather than returning it to pre-Cyber Week sale levels. This allowed them to have an advantage of efficiently scaling their reach to target Green Monday shoppers. They saw a 4-point improvement to their CVR compared to the previous time frame, which led to increasing sales by 209% while Cost of Sale remained flat. Increase CPCs to stay competitive. Work with your Criteo Account Strategy Team to ensure you have a spending plan to maximize your reach of highly motivated shoppers. Create personalized coupons to drive buzz. 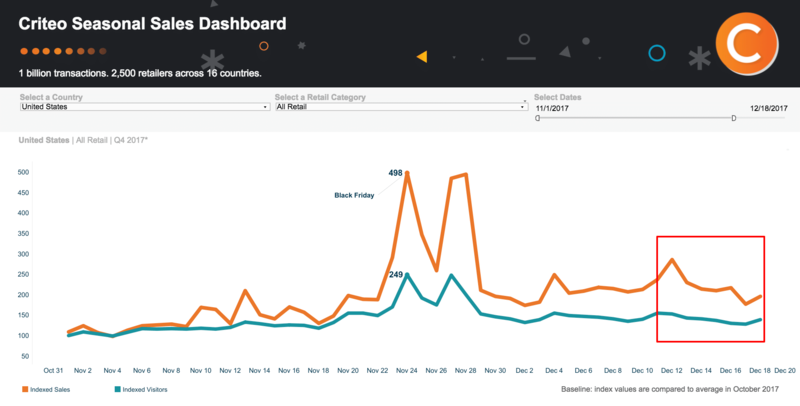 For more on holiday shopping trends, check out the interactive Criteo Seasonal Sales Dashboard to get insights into sales peaks, site traffic, and mobile share around key seasonal periods, and be sure to download our 2018 Holiday Report. Kate is a Senior Account Strategist pretending to be a Bostonian until winter comes and she shows her southern roots. 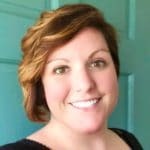 When not championing for her clients she is chasing after her 4 year old while listening to podcasts and obsessing over the latest Broadway shows.